Last week, I vacationed on beautiful, balmy Sanibel Island in Florida. Lazy days consisted of book reading (Tina Fey’s Bossypants…hilarious, insightful, like chatting with a good friend…seriously so good) and flipping through fashion magazines. We went on a boat and watched playful dolphins (!!!). We lingered on the beach, watched birds, waded in the warm waters of the Gulf of Mexico, and searched for shells. And of course there was lots and lots of mojito-drinking (did I mention lots?) and eating. Now, Southwest Florida isn’t exactly known for being vegan friendly. Luckily, I found some tasty entrées. I’ll be sharing my culinary escapades later this week (don’t deny it, you’re excited!). But spoiler alert! The best meal I ate was the salad at the restaurant Traders Cafe. Now I know what you’re thinking. A salad?? I’M not even a huge fan of salads (weird for a vegan) but this hearty yet light (sounds like an oxymoron but somehow it’s true!) salad is different. When the salad came, I finessed it by drizzling olive oil and squeezing fresh lemon juice on top (save your money! This combo is the best salad dressing ever, no joke) and adding salt and pepper. Every bite was perfection. Succulent and seductive with an intoxicating, rich umami flavor, these portabella mushrooms were seriously the most delectable and luscious mushrooms I’ve ever tasted. Tart and salty olives, sweet juicy tomatoes, baby spinach and toasted pine nuts, which added a subtle and delicate nutty flavor — all of it combined hit every note on my palate. The piece de resistance was the acidity of the lemon juice brightening the whole dish. While the server told me the mushrooms were only marinated in olive oil, for my home version I marinated the mushrooms in a vinegar, soy sauce, herb mixture to capture their unctuousness. I also added peppery arugula to the salad just because I absolutely, love, love, love it. While it’s a delicate salad perfect for summer, the heartiness of the mushrooms and nuts elevates this dish from a mere salad to an enticing entrée. Tip (I know, I know, you’re excited for a tip! ): If you keep the portabella mushroom caps whole, serve alone as side dish or entrée or place them on buns and eat them burger style. And who doesn’t love options?? 1. For the marinade, combine soy sauce, balsamic and red wine vinegar, and herbs in a bowl. Whisk together. 2. In a plastic sealed bag, place sliced portabella mushroom caps. Pour marinade into bag. Seal and shake gently. Let sit for 1 hour. 3. Remove mushrooms from bag. Discard marinade. 4. In a skillet, pour 1 tablespoon of olive oil. On high heat, pan-grill portabella mushroom slices until golden brown on each side. Set aside. 5. On a baking sheet, spread pine nuts. Toast in a 350 degree F oven for about 5 minutes. You’ll know they’re done when you can smell them. 6. In a large mixing bowl, combine spinach, arugula, tomatoes and olives. Toss. 7. Season with olive oil, lemon juice, salt and pepper. Toss again. 8. Divide salad on 4 plates. 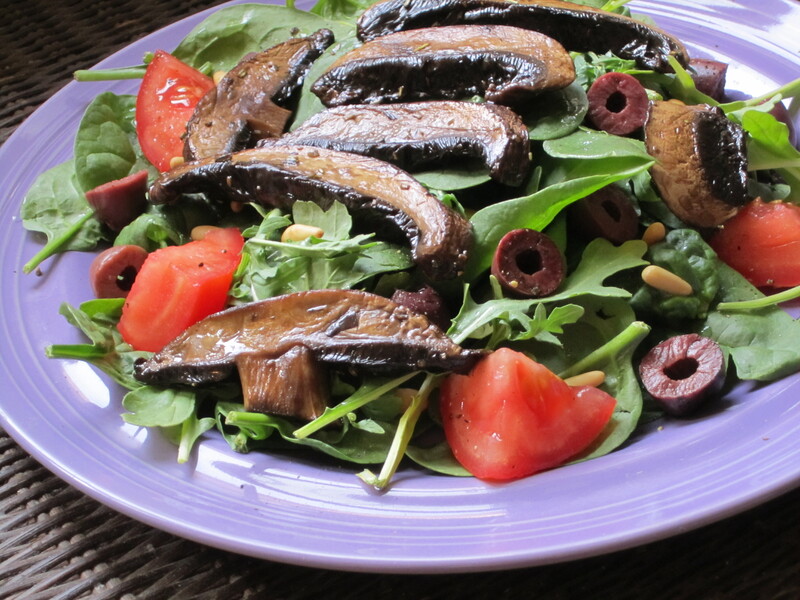 Place grilled mushrooms on each bed of salad. Serves 4 | Bon appétit! Tags: food, Meat-Free Monday, Meatless Monday, Mushroom, recipes, salad, Sanibel Island, vegan. Bookmark the permalink.